Thank you for your interest in our Debutante Cotillion and Scholarship Program. The Program consists of community service projects, cultural activities, educational workshops and monthly meetings that culminate into our debutante presentation event, where you are presented. Psi Beta Zeta Chapter will accept a maximum of twenty (20) Junior/Senior high school girls in their Debutante Cotillion and Scholarship Program. There will be an in-person interview for all applicants to accommodate interest exceeding the maximum. The accepted young ladies will receive communication with the date, time, and location of the orientation. During this meeting Psi Beta Zeta Debutante and Scholarship committee members will provide a complete overview of the program in greater detail. 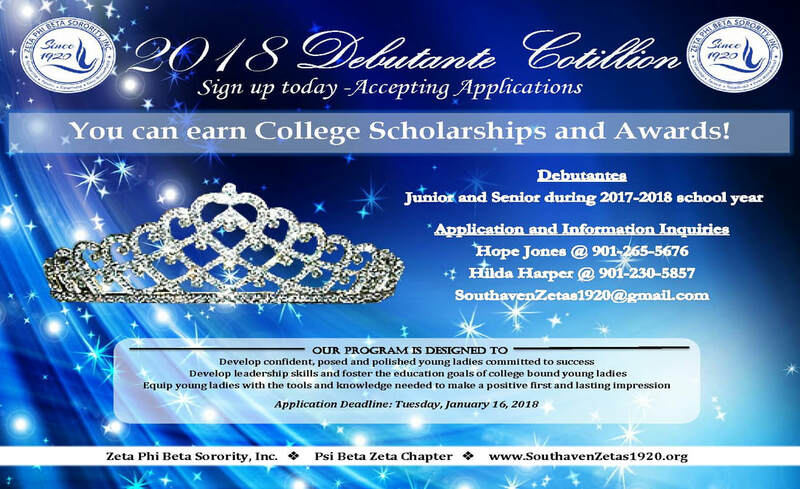 Being a debutante in the Psi Beta Zeta and Scholarship Program provides opportunities for scholarships and requires work and dedication that will reap rewards. However, there are some significant expectations for each young lady.To apply, applicants must submit a completed application along with the $50.00 application fee (Money Order payable to Zeta Phi Beta Sorority). Application and material must be received on or before January 16, 2018. Our mission is to provide an opportunity for young women, who are Junior and Senior high school students to participate in a wide range of activities that will enhance their personal, educational and career growth. The program activities will consist of workshops in social, personal, financial and career development and participation in community service projects. Zeta Phi Beta Sorority has a history of working with young ladies through the Blue Revue program that was originated in 1933. The program’s goal is to promote higher education and scholarship and to encourage and inspire young ladies to uphold and practice the ideals of finer womanhood, as well as cultivate and practice acceptable social behavior. The idea was adopted as a national program and implemented by chapters of the sorority across the country. The Debutante Scholarship Program and Cotillion is a revised extension of that pageant.